If you’re one of those people who throws away food thinking, “I wish I knew how to make a compost pile,” — this article is for you! The good new is… you’ll be pleased to know that setting up a composting system at home isn’t as much work as it sounds. 1. Choosing a space which is away from trees or fast growing vines as the roots of these plants can enter the compost pile and take away much needed nutrients. 2. Removing weeds from the area you are going to make into your compost pile so that the seeds from the weeds don’t germinate when you lay your compost on your garden beds. 3. Identifying a space which is slightly elevated so that it will have good drainage. 4. 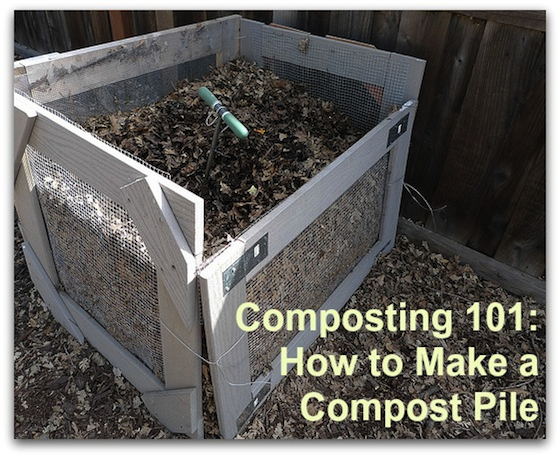 Positioning your compost pile away from the house and shed as the pile can attract insects. 5. Placing your compost pile away from a wooden fence or deck as the compost can stain and rot wood.